Pen and ink drawing with wash, M1151 Gransden post mill, 7 miles SE of St Neots. Cutting of Philip Barrett Lennard, from Cambridge Evening News 6 March 1980. Cutting about windmills in Cambridgeshire, from Cambridge Daily Press 18 December 1954. 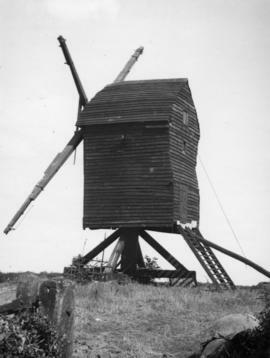 Negatives of smock, tower and post mills and watermills in Kent, Surrey, Cambridgeshire and Huntingdonshire. 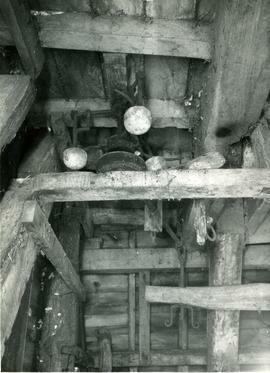 Negatives of smock, tower and post mills and watermills in Kent, Cambridgeshire and Huntingdonshire. "Work starts on mill restoration"
Research material, as compiled by Stephen Buckland, on the post mills at Bourn, Great Gransden and Great Chishill, Cambridgshire. Contains notes, correspondence, photographs, photocopies of Stephen's drawings and newspaper cuttings.